The United Framework Convention on Climate Change Conference of the Parties 21 has finally begun. Today representatives from 195 countries gathered to begin two weeks of negotiations aimed at solving the climate crisis. We can only hope that the leaders from the rich countries in the Global North that are historically responsible for today’s devastating climate change will follow the demands of justice and make big commitments – but we are not holding our breath. After 21 years of these conferences delivering nothing of any substance, the focus for civil society is to mobilise a global social movement that continues and builds into 2016. The climate justice movement has been building up to this conference for years, and with the city of Paris in a state of emergency, the stakes have been raised considerably for activists calling for a binding and just solution. 24 climate activits have already been placed under house arrest and the big demonstrations have been cancelled. This makes it all the more inspiring that so many people are still making a stand for what they believe in, and finding creative and moving ways to respond to the heightened security context. 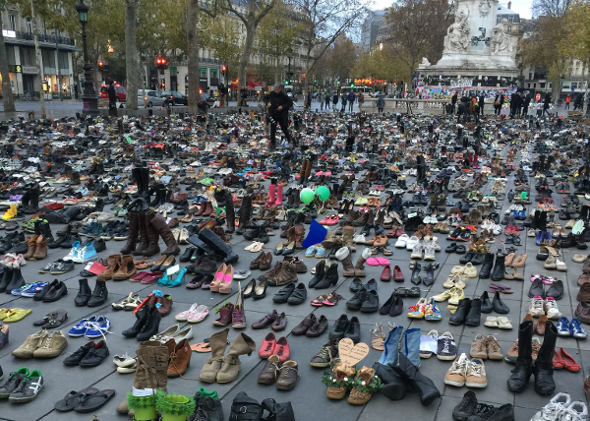 As the world marched together yesterday, over 10,000 Parisiens lay their shoes down to symbolise the political protest they were denied the right to hold. There was also a peaceful human chain along the route where the march was due to take place. The Brandalism Project has seen over 600 billboards and adverts across Paris being ‘subvertised’ to call attention to corporate control of institutions – not least the climate talks themselves, which is sponsored by aeronautics and car manufacturers and fossil and nuclear energy companies. As I write, protesters are outside St Pancras in London, performing creative artistic responses in solidarity with the Indigenous groups and climate-impacted communities that are bearing the global effects of climate change. The next two weeks are going to be a fascinating and inspirational array of courageous actions from all sorts of different groups and individuals. If only our politicians could work together in the way that global civil society is, we’d be well on the way to real solutions. Birmingham Friends of the Earth are still going over next weekend to add our voice to the calls for a fairer world. In the meantime for updates from grassroots, Southern and activist voices, New Internationalist are reporting directly from Paris for the next two weeks.